With print copy of the Witch on the way and the ebook/print version of Eldritch Witchery also coming along I thought I'd spend some time talking about Witch Traditions. What is a Tradition for the Witch class? Historically Tradition is like a style or even a denomination of Witchcraft. In my books Traditions are styles of witchcraft too, but it is also a bit more. On the roleplaying side a Tradition helps define what sort of witch they are. Their background, how they learned to be a witch and how they get their Powers and Spells. It also help define what their familiar is like. For example a witch might roll and get "Toad", but for a Faerie witch this toad could be a nature spirit, for a Maleficia it is a small demon. In both cases it just happens to look and act like a toad. Each book has a different set of Traditions so if you do get them both then there is something new in each one (there are more difference than just this, but this is what I am talking about today). The Traditions are roughly set up the same way and have particulars according to their supported rules, but translation is easy. There are even new Traditions in the upcoming Player's Companion for the Adventurer Conqueror King System. I had some input on how the new ACKS Witch works (not a lot but some) and some of it was based on some of my earlier work. Bottom line for you. The ACKS witch is very compatible with the witch from "The Witch" and "Eldritch Witchery". There are also Shaman and Warlock classes in ACK-PC that would mix in great with any game that has a witch in it. ACKS though is based on 14 levels, Eldritch Witchery on 20 levels and The Witch on the classic B/X 36 levels. So you will need to move the powers across the levels some. The ACKS-PC witch gains special powers by Tradition at 1st, 3rd, 5th and 7th level. The Witch gets occult powers at 1st, 7th, 13th, 19th, 26th and 31st levels. In Eldritch Witchery the witch gains her Occult powers at 1st, 7th, 13th and 19th level. For my witches the 1st level power is a familiar. The Witch and EW can be played just as easily with 14 or 20 levels. Well...13 and 20 actually works better in my mind (make the 21st level witch the Queen of Witches). I am not going to mention the traditions in the ACKS Player's Companion. I will wait till it comes out. Sufice it to say there are two that are roughly the same (and this gives a base to compare) and the others that are new. All of them are given the ACKS-world twist. Charles Myers, a contibutor to the ACKS Witch class has even put up some new Traditions on his own blog. I have not tried to convert these yet, but my rough eyeballing of them tells me they should work fine. If you picked up Joesph Bloch's wonderful Adventures Dark and Deep Witch or Jonathan Becker's Witch from the Complete B/X Adventurer then you can also use this with them and visa versa by implementing the Tradition idea. Joesph Bloch's presents a deliciously evil witch I really want to run under B/X rules. I would probably call her a Malevolent Witch (Malefic was already taken). This witch is limited to 13th level so she is a good fir with ACKS-PC. Or use this witch in place of my Malefic one. Joe makes a lot of great points in his book on how to play an evil witch. Jonathan Becker's witch is harder to fit in, though I do love how it works. In this case choose one or the other witch and then take the things you like from the other books. 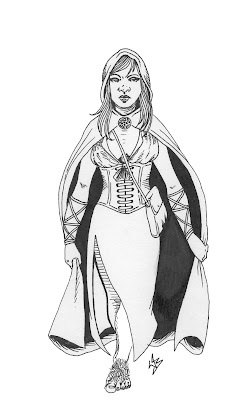 Daniel Proctor put together a "Diabolic Witch" for OSRIC that would also port over nicely. These are not the only Traditions you can use (but it is a lot!). You are certainly free to make up your own.